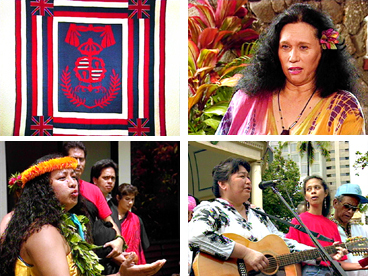 The coalition took the name Hui Na‘auao, referring to a "group seeking wisdom or enlightenment." This program presents some of the members of this coalition and their views on self-determination. Rare turn-of-the-century archival film footage and photographs are contrasted with modern-day scenes of rallies, evictions, arrests and political events, all woven together by the inspiring "Sovereignty Song," by Peter Apo and Jeff Rasmussen. Steve Kuhio Vogeler, Dawn Farm-Ramsay, Keoni Agard, Dallas Vogeler, Kawehi Kanui, Walter Keliiokekai Paulo, Kaliko Chun, Leroy Akamine, Ululani Bierne, Hooipo Nakea Pa, Bruss Keppeler, Poka Laenui, Charles Kaaiai, Davianna McGregor, Kekuni Blaisdell, Kunani Nihipali, Lela Hubbard, and Steve Kamahana.